"Train, say your prayers and eat your vitamins!" Anybody growing up in the 80's probably heard that line from wrestling and pop-culture legend Hulk Hogan. A role-model to kids as influential as anyone at the time, Hogan created a catchphrase that while maybe a bit shallow, at least had vitamins in it. The message athletes seem to be sending today is, "train, eat your McDonalds, and drink your coke!" Sure, that isn't said outright, but a recent study commissioned by the WAT-AAH! Foundation, in conjunction with Fit Kids, concluded celebrity endorsements of products will persuade children and adolescents to use those products. Peyton Manning's conditioning probably wouldn't allow him to lead many 4th quarter drives if he ate a steady diet of large pizzas. The study took place this past October, with a series of focus groups containing 166 kids, from 8 to 17 years old. The study focussed on big markets including New York, New Jersey, Boston, Chicago, Atlanta, Washington D.C. and Virginia. Fieldnetwork Incorporated recruited the respondents. The groups were shown eight commercials, each with at least one celebrity from the sports and/or music industry promoting products from companies such as Diet Coke, Sprite, Pepsi, Gatorade and McDonalds. The study's key findings concluded that kids and teens revere celebrities and wish to be like them. That may be self-evident even without the study, but it was found that seeing their idols endorsing something will naturally persuade kids to use that product, as a way of connecting with their favourite player. Contradictory to what advertisers claim, the respondents in the focus group felt the commercials were aimed specifically for them. They cited the catchy music, inspiring messages, fun graphics and sports scenes as their takeaways from these ads. The commercials also featured desirable qualities that kids and teens strive for; namely improved performance and a boost of confidence. In other words, a way for them to be like their idols. It's hard to believe that can be accomplished by chugging a bottle of Pepsi or wolfing down a hamburger at McDonalds. Would it not be weird if we saw a Joey Chestnut-type endorsing broccoli or carrots? In October 2013, The Richest published an article pointing out that $20 million of Lebron James's endorsement deals go towards unhealthy foods. The more recent study commissioned by the WAT-AAH! Foundation included one comment by a respondent saying, "When I first saw Lebron James (Sprite), I was like ‘wow.’ I would probably buy it because he’s a celebrity and he’s my role model.” Of course, a kid will want to be like Lebron. Who doesn't want to dominate a sport, win championships and make millions? 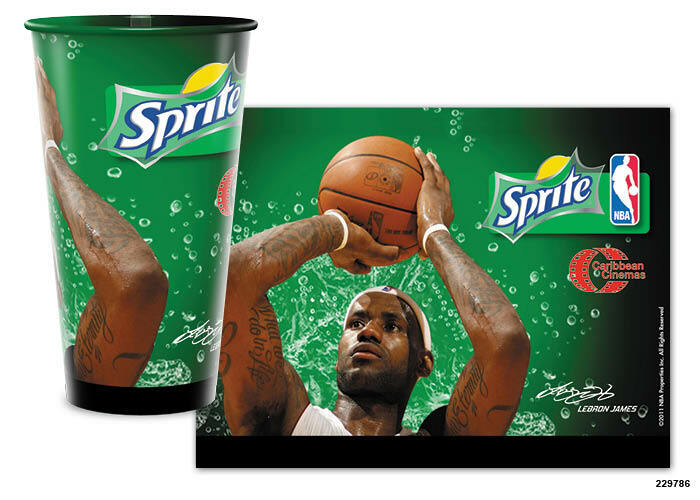 However, does Lebron's talent stem from Sprite? No, and its consumption obviously won't do anything to help a kid's basketball aspirations. The study reported that the adolescents viewing these ads were able to conclude for themselves that there isn't much believability to these commercials. However 77% of the respondents admitted they initially believed the ads were compelling and encouraged them to buy the products being advertised. That number dropped to 23% once the kids discussed the believability of the commercial's content and message, as well as the health effects of the products in question and the financial motivation for those athletes to endorse these products. The focus groups also concluded that athletes simply endorse these products for financial reasons and to boost their level of fame. The respondents then openly discussed, unprovoked, the health detriments from the overconsumption of these products, including diabetes, weight and obesity issues and hyperactivity. The respondents then went on to conclude they felt a little betrayed or deceived. They described these celebrities as 'dishonest, misleading or selfish'. At least these kids seem to have some perspective on the realities of the world. Unfortunately, not all kids have the benefit of being a part of a focus group and openly discussing these issues. All in all, the kids enjoyed the commercials they were shown, but expressed a desire in seeing their idols, sports figures or not, promote healthier products. Rose Cameron, CEO/Founder of the WAT-AAH! Foundation agreed that athletes do have a lot of influence in how kids lead their lives. That power can be steered in a better direction. “Kids really look up to these celebrities, they love to watch them on television and they are significantly influenced by them. The insights these kids shed on what the celebrities themselves can do to turn this health crisis around was inspiring,” says Cameron. “Celebrities could be utilized to promote a healthier agenda, it can make a huge difference. That’s what the kids are really saying in this study,” she adds. The kids in the focus study expressed desire in seeing athletes do the same type of entertaining commercials, but for healthier products. One participant stated, “If you make commercials, do it for healthy products like vegetables, fruits, water or milk, make it as fun and cool as your Sprite commercial (LeBron James).” "If you have to make these commercials for money and publicity, tell us not to eat or drink too much or tell us about the bad stuff that's in it." Perhaps the innocence of these children conveys an idealistic situation. Of course it would be better for Peyton Manning to throw a touchdown pass after eating an apple, or Lebron James to perform a slam dunk after a gulp of milk. Perhaps them warning kids about overconsumption of junk food is a more realistic scenario. Products that were advertised 20-30 years ago now have a stigma attached to them. Maybe junk food will eventually follow suit. Perhaps it's also best to teach kids that celebrities, including pro athletes are not the ones they should be looking up to and emulating in every way. Their performance in a game is one thing, but the reality is, they'll continue to make millions endorsing unhealthy products and the motivations behind them are unlikely to change. Who would turn down millions for sipping a bottle of Pepsi and saying how tasty it is? It's been reported that Peyton Mannings brings in $10 million per year from his combined endorsements which includes Papa John's Pizza, Gatorade and Wheaties. Kobe Bryant made $12 per year for his endorsement of McDonalds, and LeBron James is making $5 million per year to endorse Bubblicious. The companies that have the big bucks will be the ones to lure the best athletes to endorse their products, whether they're healthy or not. It will take a special kind of athlete to opt to endorse health foods for a significantly lower price. Maybe opening up this same discussion with kids is the best way to start addressing this problem.